After last month’s almost-a-post-a-day, I’ve hardly blogged at all this month. 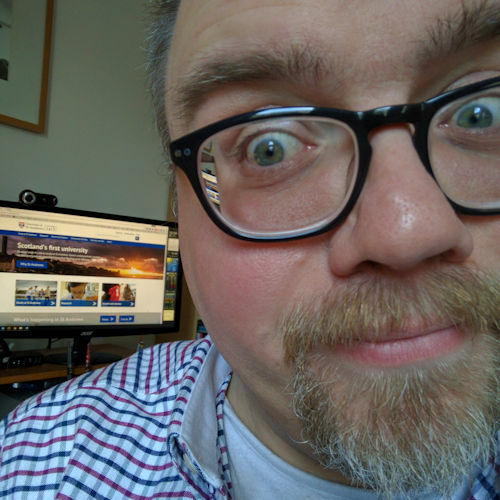 And there’s been a pretty good reason for it: I’ve been working most of the last three weeks on coding up the designs for the University of St Andrews’ 600th anniversary website, which went live yesterday. And I really do mean “most of the last three weeks”. I’d get home in the evening, help put the boys to bed, and then crack on with more code until sometime after midnight each night. I’d crash into bed for about 4 hours’ sleep before booting up the PC again and working for a couple of hours until the boys woke. Then it was breakfast and back to the office for… oh, more coding. It’s not our preferred way of working, if I’m honest. But they were brilliant at getting updated proofs to us. Anything involving image work takes hours so it was great having professional Photoshop-meisters on the other end of an email. I’m going to blog about our experience of the project very soon on the St Andrews Web Team blog. …and if that wasn’t exciting enough, I also had the Alumni pages to code up too. Tonight was my first night off in weeks from working on the code. So I chose to blog about it instead!